Big thinking is our business. We love TED, Twitter and all things intellectually transformative. We’re constantly reading, writing, talking, and creating informative tools about strategic marketing and branding in the health care industry. We love introducing fresh, new thinking to help healthcare executives and hospital marketing teams develop a deeper understanding of the field’s challenges and opportunities. Check out a few of the things we’ve written, a few places where we’ll be, and a few sites where we spend a lot of time. So, Where Do We Go From Here? Healthcare Marketing in an Era of Change. More than ever, across all industries, marketing executives are being held to higher standards of accountability for driving growth, innovation, customer loyalty, and better business performance. A volatile economy, coupled with complex, competitive dynamics and accelerated growth in web, social media and mobile technologies, is fueling the momentum for transformation of marketing practice. These two articles, written with Brains on Demand and published in Healthcare Marketing Report (2012), address the changing nature of competition in the health industry as well as the changing role of marketing executives. Download the PDF. The CMO as Chief Innovation Catalyst. Scan the pages of any health system strategic plan these days and you’ll learn that transformation of care delivery systems, business processes, and market strategies are top of mind for healthcare executives. The underlying basis for competition is changing and will continue to do so as market and government reform-driven movements take hold. Changing economics are front and center, creating unprecedented opportunities for marketing leaders to step up and be integral catalysts for innovations that drive growth, customer loyalty, and better business performance. 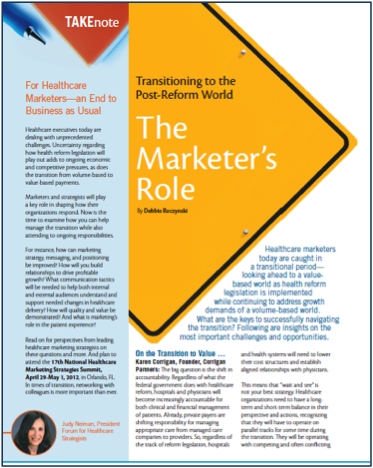 This article, published in Healthcare Strategy Alert (2012) explores how marketers must transform their own roles and functions to reposition the marketing function as a strategy-critical business competency aimed at achieving organizational growth and profitabil­ity. Download PDF. Transforming to the Post Reform World: The Marketer’s Role. Healthcare marketers today are caught in a transitional period— looking ahead to a value- based world as health reform legislation is implemented while continuing to address growth demands of a volume-based world. What are the keys to successfully navigating the transition? This article in Healthcare Strategy Alert (by Debbie Reczynski of the Forum for Healthcare Strategists) provides insights from Corrigan Partners founder, Karen Corrigan, and other leading marketing experts. Download here. 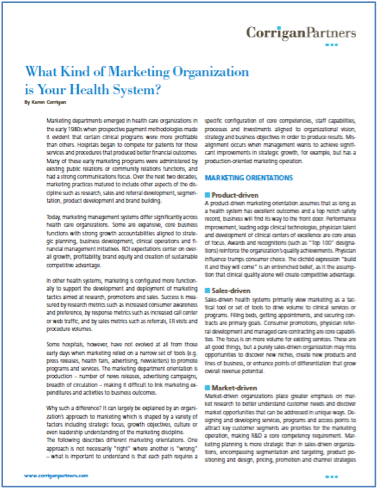 What Kind of Marketing Organization is Your Health System? By Karen Corrigan. Marketing management systems differ from health system to health system. Some are expansive, core business functions with strong growth accountabili­ties, others are configured functionally to support the development and deployment of marketing tactics, and still others have not evolved from those early days when marketing relied on a narrow set of tools to promote programs and services. This article describes 5 different approaches to marketing management – and the importance of aligning structure to strategy. Download here. The Price is Right by Karen Corrigan. 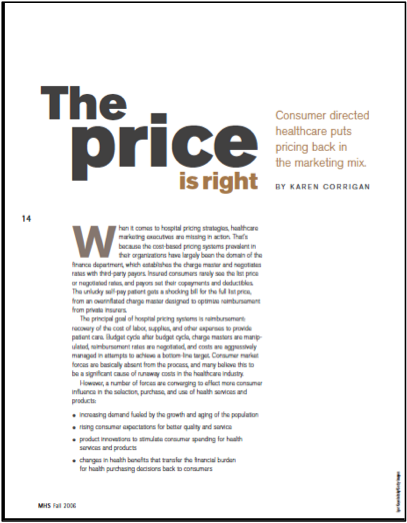 When it comes to pricing strategies, healthcare marketers are rarely at the table. That’s because the pricing systems prevalent in healthcare organizations have largely been the domain of the finance department, which establishes the charge master and negotiates rates with third-party payors. The principal goal is reimbursement: recovery of the cost of labor, supplies, and other expenses to provide patient care. But how are pricing strategies considered for consumer out of pocket expenditures? And what role should marketers play in those decisions? (AMA Marketing Health Services 2006) Download here. The CMO’s Leadership Imperativeby Karen Corrigan. 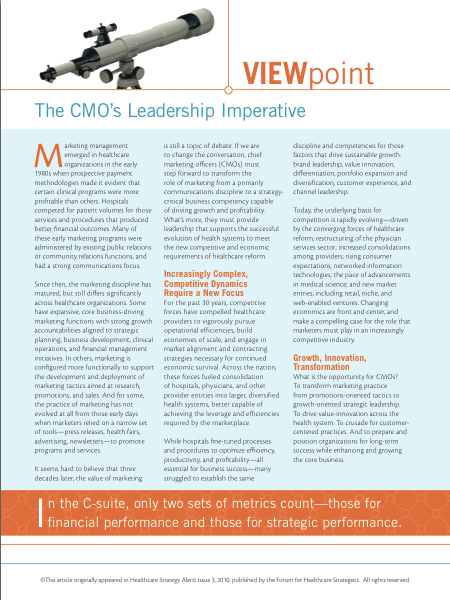 This article, published in 2010 in Strategy Alert for the Forum for Healthcare Strategists, makes a compelling case for the role that healthcare marketers must play in an increasingly competitive and complex world. Download here. Setting Marketing Goals by Karen Corrigan. This article, written by Karen in the summer of 2011, is about setting marketing goals as part of a strategic marketing plan. Strategic marketing plans must specifically state a health system’s overall growth and profitability goals for its service area and major lines of business, including volume goals, payor mix objectives, desired financial outcomes and return on marketing investments. Download here. Chief Marketing Officer – Karen Corrigan blogs on topics of interest to healthcare marketing executives. Mayberry General – Brian Whitman blogs on marketing challenges and solutions for small and rural hospitals. SarahBethRN – Sarah Cowherd, RN BSN, blogs on nursing, technology and social media from the perspective of a Gen Y nurse.